This list of 17 items is one that every lottery winner should take a look at when they're bored or temporarily spent out. From expensive sunglasses to champagne to a $10 million chess set - there's something for every rich winner here. From the moment you are delivered by opulent Rolls Royce past giant water fountains, this Abu Dhabi hotel called the Emirates Palace will blow your mind. It has 1.3 km of private beachfront, and is surrounded by 85 hectares of gardens. Each room is built for ultimate comfort and luxury. Watch the video and prepare to book your room - for just a cool US$500-$1,000 a night. If you won the lottery, you'd put a lot of it into the bank, right? After all, you're unlikely to earn that much again, ever. Not these 10 winners. They spent it all on the fun of life until most of their riches was gone. Find out how they spent their vast wealth, and resolve never to copy them! The most expensive hotel rooms, exotic cars, cell phones, shoes, giga-yachts... this is a standard list that Lottery winners recognise every day in their search for the ultimate status and convenience. But a $300,000 hamburger? What is going on! Many guys buy cars when they win the lottery. It's a long-held dream and once they have the money they go for it. But it's always nice to see how other rich collectors fill their barns, and the 'Home Improvement' star has one of the best we've seen. Take a look at some of these gleaming authentic American motors. Kelsey Zachow won $66 million a Mega Millions lottery jackpot - then went back to work. She was happily told by her boss to leave...wise choice! There's a growing trend for lottery winners to go back to work. Ringo started the National Lottery draw evening off by saying "I've got my ticket, and you've got yours." On that dramatic note he went on stage with his group to sing a song that sounded very much like all his others. No matter, it was history - of sorts - in the making for the Lottery. He's a Beatle after all. Want some ideas on how to spend those millions of dollars you got from last night's lottery draw? These winners all did the sensible thing and invested most of it. One winner bought a new Cadillac, and put the rest in the bank. Where's the fun in that! If you want to know whether it was worthwhile, listen to what they say about their good luck. Maybe it'll give you some ideas. The good thing about celebrities, they are always buying and selling homes depending on the amount of money they got from their last film. So that's good for lottery winners looking for an impressive home, and who can afford to buy anything. Any of these homes appeal to you? Not even Donald Trump's 80,000 sq ft Florida beachfront property? As president he may not be selling up yet. 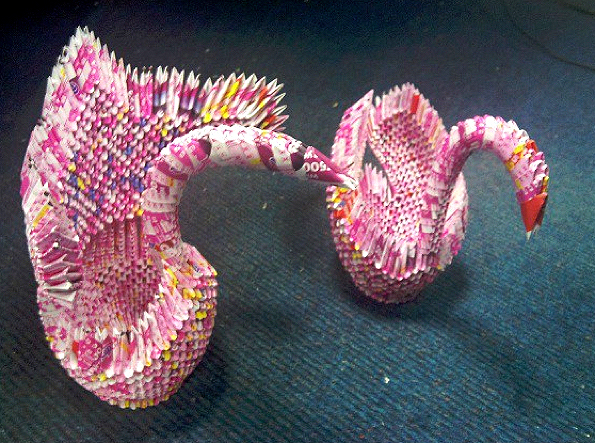 The two fancy swans in the photo below were made from old - and we hope expired - lottery tickets. You can see how it's done in the video by a modelling expert who says that it is really easy if you follow his steps. Takes a while, but what a great way to use up your losing lottery tickets!